All students are invited to attend the One-Stop Job Shop (OSJS) hiring event to connect with 50+ for-profit and nonprofit organizations from a variety of industries. Employers are seeking Saint Mary’s student applicants from all years and majors for full-time entry-level career positions, internships, and part-time jobs. The list of employer attendees will be continually updated until the event. Register and check out employers/company profiles on SMC Handshake here. 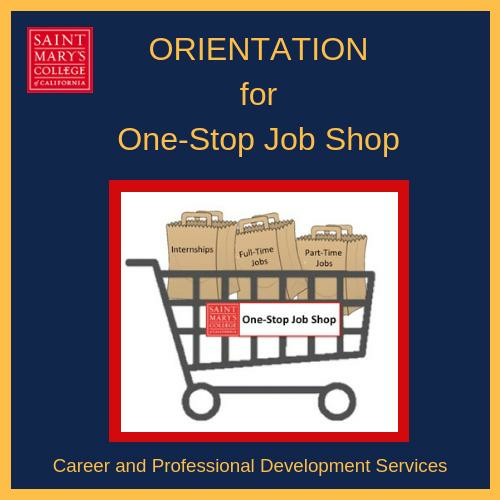 Prepare for OSJS with an orientation, networking advice, and resume workshops offered by SMC Career & Professional Development Services (CPDS). Register for OSJS workshops on SMC Handshake here. Résumé approval by 2/22 is required for students to attend OSJS. Plan ahead, and review sample résumé format here.